November has so far been a month of boats – one big and one tiny. Both beautiful. 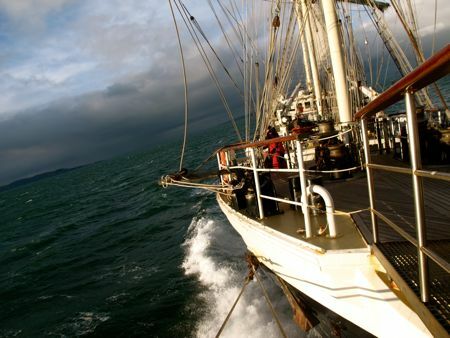 It started with a week long trip aboard Tenacious, one of the gorgeous tall ships operated by the Jubilee Sailing Trust. 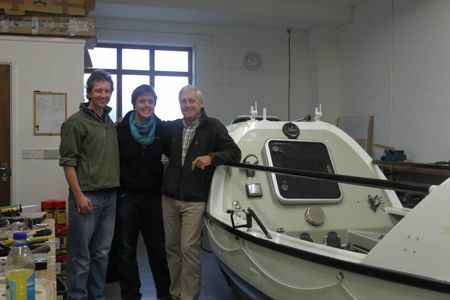 Having been invited to become a Vice Patron shortly before leaving the UK on my expedition in 2011 without ever having sailed with them – only being a big fan of what they have been doing for the last 30 something years – I was keen to get afloat prior to Chapter 2 of the Pacific next year. This Belfast to Milford Haven leg turned out to be a wonderful entree to my JST sails. It was energising to be on the water again, uplifting to meet lots of new and lovely people of all ages and walks of life, interesting to get to know the nuances of square rig sailing… and a personal victory not to have re-encountered my dinner on deck at any stage, even after spending half an hour perched on a tiny bit of line eleven metres up on the yard arm tying up sails as a squall hurtled through. Following my experiences in June I was a bit wary of what my subconcsious might make of any rough stuff we encountered. While my heart raced a bit at seeing the portholes in the lower mess swirling like washing machines as we heeled over into the surf on our way across the Irish Sea and flashbacks made my mouth run dry from time to time, it was all manageable. This bodes well for the spring and I am as eager now as ever to get back onto the ocean and the oars. For more information on the JST or to book yourself onto a voyage then please click here. The next boat of this blog’s title is a tenth of the size of Tenacious and named after one of the most special things in the world – Happy Socks. Sister boat to Gulliver and Blossom, she will be my Pacific partner. Following various modifications and additions over this last month by boatbuilder genius and artist Jamie Fabrizio and some thinking time from Design legend Phil Morrison, we will be picking her up next week. More on the additions and modifications at a later date. P.S: To fully understand the power of Happy Socks then take a look at my book ‘A Dip in the Ocean’ – available in paper and Kindle format all over the world. Published in English (both UK and US) and German. P.P.S: RGS Explore Event this Friday – looking forward to seeing many of you there. Info here if you would like to come along. P.P.P.S: Night of Adventure, Oxford – A great evening for charity, 29th November. Tickets here. I am heartily looking for your arrival to Japan again next year, and we pray for your success of rowing cross over the Pacific ocean to Canada, and cross over the Atlantic to London!! It is an unbelievable and risky adventure. You are very brave to go on such a big adventure!!!! You are very brave to go on such a big adventure!